This article is about the race course from Mario Kart: Double Dash! !, unused course in Mario Kart DS, and retro course in Mario Kart Wii. For other race tracks with similar names, see Mario Circuit. Mario Circuit is the second race course of the Flower Cup in Mario Kart: Double Dash!!. This version of the course features many of the typical elements of a Mario Circuit, such as Warp Pipes, Piranha Plants and giant mushrooms, visually similar to World 1 in various games from the Super Mario series. It also introduces the new element of Princess Peach's Castle around which the course takes place, an element that appears in all later Mario Circuits, and also features Goombas, Piranha Plants, and a Chain Chomp as obstacles. This course appears at the end of the credits in Mario Kart: Double Dash! !, as well as in the "Thanks for playing!" image seen after completing All-Cup Tour. This course was originally going to appear as a retro track in Mario Kart DS but was removed from the final game, later appearing as the final course of the Leaf Cup in Mario Kart Wii. This track shares the same music with Luigi Circuit and Yoshi Circuit. An arrangement of the music for these courses appears as one of the selectable songs that can be played during events in Mario & Sonic at the Olympic Games (Nintendo DS version), Mario & Sonic at the London 2012 Olympic Games (Wii version), and Mario & Sonic at the Sochi 2014 Olympic Winter Games. The starting line for the course is situated alongside Princess Peach's Castle, from which the player drives straight for a short distance to a left turn, followed by a hairpin bend towards the right. This is followed by a long and gentle left turn around a patch of grass with a Chain Chomp, which will occasionally come out and attack the player, who will spin out if hit. This is followed by a gentle S-curve within a tunnel, followed by a straight level bridge. This then leads to another short stretch of straight road with a pair of Piranha Plants on each side, which attempt to bite the player and cause them to flip over if caught. The player must then drive around a left hairpin bend and a right turn, where they approach a bumpy section of road with Goombas, which follows another gentle S-curve shape. After another left turn the player then jumps over an arched bridge towards the finish line, where there is another Piranha Plant on each side of the road. Part of the circular curve can be skipped and the Chain Chomp avoided by using a Mushroom or speed-boosting item to cut across the grass behind it. To make up for being scrapped from Mario Kart DS, the course reappears in Mario Kart Wii as the fourth track of the Leaf Cup. Although no major changes have been made, apart from a slight design update, the player can now perform Tricks off of the bumps in the road and the arched bridge approaching the finish line. The tournament for this course was a time trial race, with an increased number of Piranha Plants and Chain Chomps. It was the first tournament of October 2009, and was repeated as the second tournament of July 2011, the first tournament of October 2012 and the second tournament of December 2013. Mario Circuit was originally planned as a retro track in Mario Kart DS, but was removed prior to the game's release. 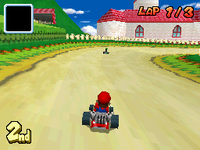 The track would have used the textures "BeachTree1", "kuribo", and "mario_tree", which still remain in the game's files. There were no Goombas present toward the end of the track, and had reduced graphics due to the limitations of the console. It can still be accessed in the game's data, and can be found by Action Replay without textures or through ROM Hacking with textures. Official European website: "With pipes rising out of the surrounding hills and Goombas and giant Chain Chomps littering the track, this is classic Mario Kart action in all its glory." The Mario Kart from Nintendogs plays the theme from this course when used. This page was last edited on December 19, 2018, at 11:23.